A Glance At Monthly Meat And Poultry Trade In The U.S.
DISCLAIMER: Readers of this article should prepare themselves for copious amounts of fun related to trade data. However, all pundits may find it educational and laborious. If that disclaimer does not draw a reader in then nothing ever will. International trade is an integral part of the livestock, meat, and poultry industries, and some would say trade continues to grow in importance. A more appropriate description of trade may be that it greatly influences domestic market prices and thus profits for domestic producers. International trade has a lot of moving parts, and sometimes it can be difficult to discern the implications of changes to quantities and values. Beef imports to the U.S. the first four months of 2016 totaled more than 1.06 billion pounds which is a 12.8 percent decline from the same period in 2015. However, that total is 22.3 percent greater than the five year average for beef imports. Beef imports realized a strong increase when the domestic cattle inventory was extremely low and then garnered an additional boost with strong domestic beef prices and the strong value of the dollar in 2015. The major beef import sources are Australia, Canada, Mexico, and New Zealand. In 2015, Australia and New Zealand led the way on the import side and they continue to do so. However, imports from Australia and New Zealand the first four months of 2016 are down 25.6 and 12.2 percent compared to the same time period a year ago. Alternatively, imports from Canada and Mexico have increased 8.0 and 11.0 percent. Beef exports from the U.S. totaled 723 million pounds through the first four months of April which is practically unchanged from the same time period one year ago. Exports for January through April are 6.7 percent below the five year average, but this is to be expected considering the rebuilding of the cattle herd, high beef prices, and a strong U.S. dollar. By far, Japan is the largest export market while Mexico, South Korea, Hong Kong, and Canada vie for the other top spots. The major growth in beef exports the past several years has been through Japan, Hong Kong, and Taiwan while exports to Canada and Mexico have slowed. Growth or contraction in the export market will play a major role in the profitability of cattle operations the next several years. 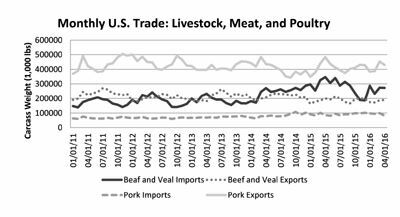 As is evident in the accompanying graph, pork trade is much different from beef trade in terms of volume and net trade. The U.S. pork industry relies more heavily on the export market while imports are not as big of a factor. Pork imports in 2016 have totaled 376 million pounds which is 3.0 percent higher than a year ago while pork exports totaled 1.65 billion pounds the first four months of 2016. Imports from Canada have accounted for 71.5 percent of total imports in 2016 thus far while they accounted for 76.5 percent in all of 2015. Pork exports are a little ahead of 2015 but 4.0 percent below the five year average for the first four months of the year. The primary pork export markets are Mexico, Japan, China, Canada, and South Korea with Mexico and Japan accounting for more than 52 percent of total exports thus far in 2016. Broiler imports are practically nonexistent but the poultry industry relies heavily on the export market. Broiler exports the first four months of 2016 are down 4.0 percent compared to the same months in 2015 and down 6.7 percent compared to the five year average for January through April. The broiler industry likely finds these declines highly disappointing considering relatively low broiler prices.